Suzi's nails look fab as she rides off into the sunset wearing this rose-tinted nail polish. A perfect shade for someone on-the-go. Dress this rose shade up or down, on the town or in the office. Step 5. For a manicure that's dry to the touch in minutes, apply 2 drops of DripDry Lacquer Drying Drops to each nail. Travel to one of the seven wonders of the world with #OPIPeru, featuring 12 new shades in Nail Lacquer, Infinite Shine and GelColor. A country rich in culture and beauty, Peru's earthy landscapes, finely crafted textiles and red sand beaches inspired vibrant nail colors to brighten up your tips. 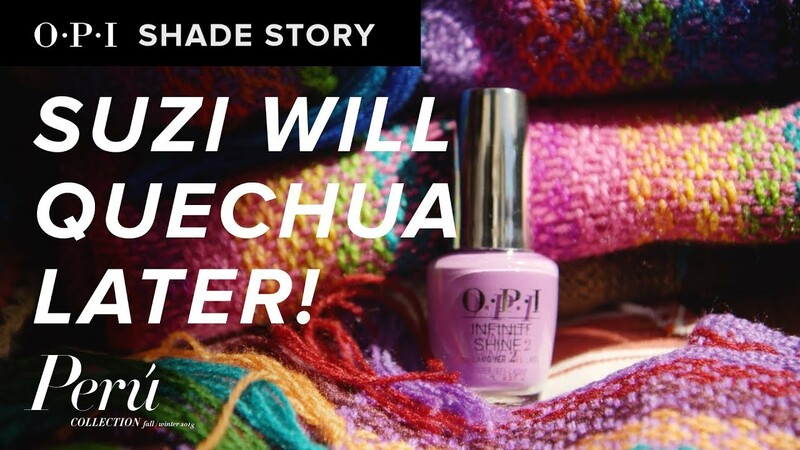 Peru is a place of endless inspiration, which led to our newest shade Suzi Will Quechua Later! a celebration of all that the country of Peru has to offer.